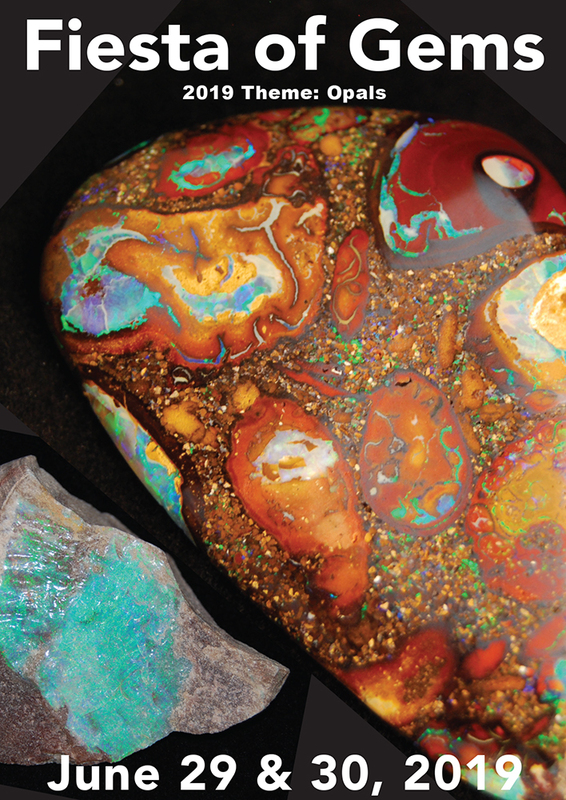 Whether you want to shop for hand crafted jewelry, beads and gem stones or check out the fluorescent minerals, do some gold panning or check out some rare fossils and specimens, you’ll enjoy the day at the Cheyenne Gem & Mineral Rock Show. We have added a Kids Area this year with plenty of fun filled activities. Bring the family and plan to spend the day at the rock show. $3 admission per adult; kids 12 and under are free. 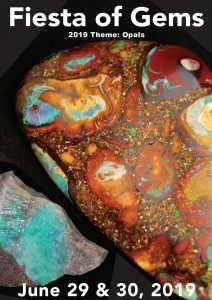 2019 Cheyenne Gem, Mineral, Fossil and Rock Show , located at Laramie Archer Complex, off I-80-Exit 370 – Sat from 9 am – 6 pm and Sun 10:00 am – 4 pm. Whether you are shopping for beads, custom made jewelry, fossils, mineral specimens or looking for some good conversation with fellow rockhounds and prospectors, be sure to mark your calendars for this event. There will be a childrens area with grab bags of minerals for the kids in additional to other childrens activities. Gem Show! Grassy Creek Mineral and Gem Show! The 35th Annual Grassy Creek Mineral and Gem Show put on by the Parkway Fire and Rescue to raise money for new equipment. This Gem Show has everything! Over 60 US and International dealers with almost any kind of jewelry, gemstone and mineral specimens, fossil, lapidary equipment and more you might want. Each booth is 20 foot by 40 foot so there are LOTS of items for sale. This is an outside event so be prepared for rain. 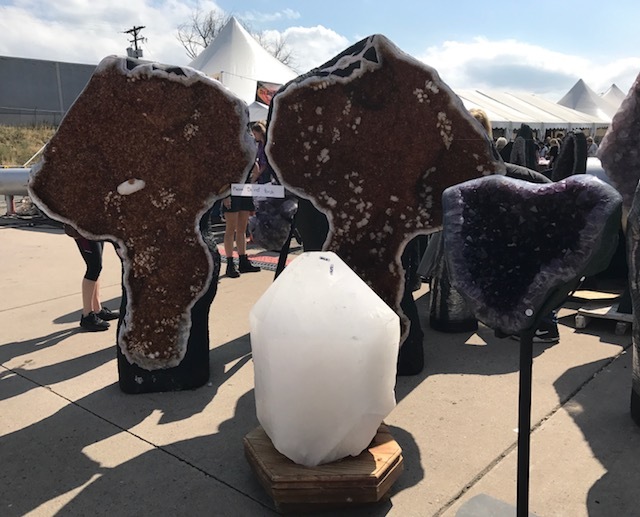 Gem Show Dates: Sunday,July 28th to Sunday, August 4th, 2019 with some vendors open on Saturday 27th. Gem Show Hours: 10 to 6 daily with many vendors open earlier and later because they are staying with their booth. Gem Show Address: 136 Majestic View, Spruce Pine, NC 28777 at the new Parkway Fire and Rescue event grounds. This location is on the hill above the previous location. Contact: Donna Collis collisdonna@yahoo.com 828-765-5519. Website is www.grassycreekgemshow.org. Applications and pictures are available on the website. 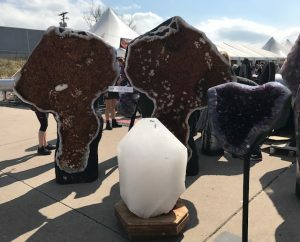 The gem show is organized by Donna Collis, who has been involved with the event for 18 years, and Roger Frye, who has helped plan the show for more than two decades. Started by the Grassy Creek Fire Department, for the first two years, the gem show took place where KFC and Taco Bell are now located. When Grassy Creek Fire Department merged with Altapass Fire Department to create Parkway Fire and Rescue, show organizers chose to keep the name. The show was later moved to the field across from Parkway Fire and Rescue for three years before moving to its former location at Parkway Fire and Rescue in 1990, where it remained until 2015. The department purchased the field from Wade Hughes in January 2016 with the intent of making it the home of the new Parkway Fire and Rescue. Parking and admission to the gem show are free and money raised goes toward new equipment for Parkway Fire and Rescue. May 4-5, 2019 is our 13th Annual Gem & Mineral Show, at the Oblates of St. Joseph, 1880 Hwy 315, Yatesville, PA (just outside of Pittston, PA). DO YOU HAVE ROCKS IN YOUR HEAD? WE DO! This is a must-do mineral show event! Great times for the whole family, many of whom make a point of returning year after year. We have many fun activities for the children, including a Treasure Hunt with prizes! There are FREE Craft Classes for the teenagers & adults. Come out & try your hand at Wire-wrapping & other Craft Classes offered. Raffles & Door Prizes by the hour. Free parking! Come see what you are missing! Treasures of the Earth Rock and Mineral Show Flyer and Coupon! Throughout the summer we plan Field Trips. Sometimes we visit a Museum or take a hike to collect Gems & Minerals. Please check out our Junior Members Page as we are sponsoring a contest for all Junior Members. Our Annual Club Picnic is held in August at the Francis Slocum State Park, Wyoming, PA, under the shelter of Pavilion #1. Date, Time & exact location will be announced when the details are finalized. All members are invited to attend as well as people who may be interested in joinging our group. Attendees are asked to bring a covered dish as well as their own beverages. In December we have our Annual Christmas Party, usually very well attended as we all love to eat! Members & their Families are all welcome to attend. You can read our monthly Newsletter by clicking on the highlighted Newsletter link. Our Links page has some interesting websites to check out for more information on Gem & Mineral Clubs & Shows in your area. We also have a link where you can get detailed information on specific Gems & Minerals. If you are looking for finished Jewelry & other Handcrafts…check out our Links page! You can print out this Member Application & mail it in with your dues or bring it to our next meeting or event. Members can post items to Buy, Sell or Trade on this page. I read an article in the New York Times, and have seen this story played out in commercials for modern day sitcoms. We are becoming so dependent on our phones, or our laptops and the social media sites that they contain, that we can not watch a television program with another person in the room without engaging an electronic device. The experience of watching TV or a movie, or reading, or being with someone else is not enough these days. The story I read talked about the generation upon us now, being born and taught to utilize a tiny screen at all times, even while a person, a teacher is standing before them speaking. According to the article, we crave as many distractions as possible, and they are not human, nor are the natural. This premise led me to reminisce about last year’s rockhounding trips. Leaving my phone in the car felt awkward, but someone knew where I was going, approximately, if I were to fall into a hole or something were to happen to me. It’s not like I needed my phone on me to dial 911 or call someone because I was in trouble. There were 2 fellow rockhounds with me. I just felt a little awkward at giving up that “distraction,” but when I did, and started marching into the woods, listening to my steps, and to nature, it felt like another world,,,and it always does when I go rockhounding. Rockhounding, or amateur geology as it’s sometimes called, for me is a great retreat from all the distractions of modern life. The tools I carry, the provisions I bring, the clothing I wear, while modern, are not very different in design or purpose than what one would carry to go rockhounding 50 years ago. Back then, we did not these personal distractions on us, so rockhounding these days, turning off your phone, having your phone disable because there’s no signal, however you can get off the grid these days, rockhounding is one way to do it. I believe we are losing the art of conversation, certainly of negotiation, and possibly sense of humor with our reliance on electronic devices. Rockhounding on the other hand requires all three of those parts of life. Conversation is a natural part of rockhounding with your crew, negotiation is required at the end of the day to figure out how to divide up the loot, and laughter and humor and fun is a common theme throughout a rockhounding trip. No devices required. 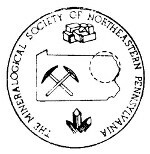 The last time I went with the Eastern Federation/NY/Long Island club group to the Herkimer Diamonds claim for instance, there were 3 of us lugging a jackhammer in a dolly, as well as towing all the other supplies like a trio of pack-mules. We met some lively characters along the way in their respective claims. There was one gentleman who goes by the name “Diamond Jim.” As we each anticipated, he told stories about how he found the largest Herkimer Diamonds ever and always finds the largest pockets. Then there was s dude named Montana at another claim. We learned later that he was living out of his van, and peddling Herkimer Diamonds to fund his gas, lodging (the van), meals, and I am not sure what the bathroom, laundry, or shower situation was, but we ended up hanging out with him for 30 minutes and helped him mine Herkimer Diamonds for gas money. Going back to the theme of this article, did I exchange numbers or anything from my phone with either gentleman? No I did not. We met along the rockhound journey, shared some banter and laughs, heard some laughable quips and tall-tales, and we engaged with each other without distraction. So by design, rockhounding is one of the most social activities in which one can participate, and no phone or distraction can make it any better. Popular TV shows these days encourage you to watch for different content on your laptop while you are also watching the show, and Tweeting and other Social Media is encouraged and rewarded. Your multi-tasking is purely solo, and does not involve or include your friends, loved ones or good mates even if they are in the same room. Compare and contrast that to a rockhounding trip with your club, loved ones and family, good buddies and friends, and consider that any distraction on your phone would not enhance your experience, but take away from it. You need all your senses ready to lay your eyes on a giant Herkimer Diamond pocket. You don’t want to be distracted when a large garnet pops out of Connecticut schist. Walking the dried creek beds in Indiana seeking a rare geode covered with growth, or concealed underground, is not enhanced if your eyes were reading the screen on your phone, like we see commonly on the streets of Manhattan for instance. To conclude, for me the Joy of Rockhounding is that it forces me to put down my phone, to expect no emails from the office, to be away from Social Media “friends” and among “real friends.” These days multi-tasking for work and entertainment is commonplace, and keeps us from cooperating and working together. Rockhounding demands cooperating and working together, and demands that we are more human and involved and engaged with each other. Charles Snider is a member of the New York Mineralogical Club, Nassau Mineral Club, Island Rockhounds, and Co-Founder of . He can be reached at Charles@americangeode.com.